Altria Pendragon (Santa Alter) (one copy per Voucher) at the Event Shop. You can increase the number of event items that drop by using Event Servants and the new Craft Essences introduced in the event. Event Main Quests are released every day; the last Event Main Quest is released December 7th, 04:00 UTC and rewards you with one Special Exchange Ticket, to be exchanged in the Event Shop for Altria Pendragon (Santa Alter). Collect Magical Stockings and use them to roll in the Event Lottery. 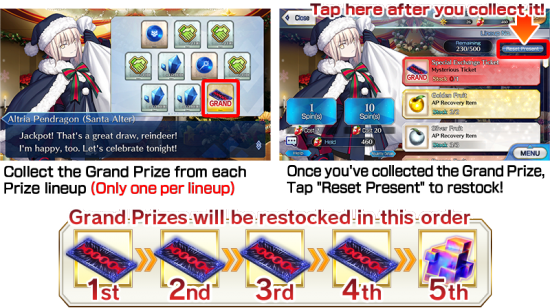 Altria Pendragon (Santa Alter) in the event shop after 2017-12-07 04:00 UTC. Altria Pendragon (Santa Alter). They can be purchased in the Event Shop for a total of 200 , 100 , and 100 .
is used to boost drops of Magical Stockings. This CE is a rare drop from event quests, and four copies can also be purchased in the Event Shop for a total of 300 , 150 , and 150 . The effect for this CE caps out at 100%, so bringing six along for 120% boost has the same effect as bringing five along. At Maximum Limit break, Holy Night sign provides 40% chance of drop increase instead of just 20%. As soon as you collect Event Craft essences (from the Event Summoning Campaign or Event Shop), setting them up in your Friend Support as below is useful. Increase the number of Magical Stockings earned by having certain Servants in your party. These bonuses are additive, so more Servants in your party means a higher bonus. Support Servants and their equipped Craft Essences also grant the corresponding event bonuses. ★5 (SSR) Jack the Ripper and ★4 (SR) Nursery Rhyme make their debut in this summoning campaign. Add them to your party to increase the number of Magical Stockings that drop. In addition, other Servants that increase Magical Stocking gain - ★4 (SR) Marie Antoinette, ★3 (R) Robin Hood, and ★3 (R) Jing Ke - will have an increased summon rate. Event Craft Essences are in this summoning campaign. ★3 (R) Lightning Reindeer will also be available from Friend Point Summon for the duration of the Christmas Pickup Summon. Jack the Ripper and Nursery Rhyme will be reintroduced to the Story Gacha at Chapter 4: London's release. Earn Magical Stockings in event quests and give them to Santa Alter to get gifts from the present box! 2x are needed for each roll in the current lottery box. 1000x are needed to empty each box. Lottery events allow the player to draw from item boxes, each of which (up to Box 5) has a Grand Prize. Once the Grand Prize has been drawn from the item box, you can either choose to reset the box and move on to the next item box (which you may choose to do if you cannot spend much time on the event) or continue drawing from the box until you have obtained the other items you want from it, or until it is empty. For Box 6 and beyond, the whole box must be drawn from before it can be reset. However, the boxes can be reset an unlimited amount of times, and because of the valuable items within each box, it is often recommended to go through as many boxes as you can. No grand prize, box can only be reset once completely emptied. It's December and Christmas is in the air. But something strange is going on in Chaldea... Waiting at the Rayshift destination was a mini-skirted beauty?! It's looking like this Holy Night won't be a silent night for the world's Masters. Prepare for a crazy journey with the mysterious Santa and her sack of dreams! "Almost Weekly Santa Alter" starts December 1 st 7:00 UTC! This page was last modified on 14 November 2018, at 05:46.